MINNEAPOLIS (AP) — With a spot in the Big Ten championship game secured, Northwestern has entered a strange pressure-free stretch of this already memorable season. No matter what happens for the 24th-ranked Wildcats in the next two games, at Minnesota and against Illinois, they’ll represent the West Division in Indianapolis on Dec. 1 against either, gulp, Michigan or Ohio State. As the first FBS team to reach a title game after losing every nonconference game, Northwestern (6-4, 6-1, No. 24 CFP) is not in contention for the College Football Playoff. Bowl game eligibility has been reached for a fourth straight year. The final two games on the Big Ten schedule will simply be tune-ups for the Wildcats, who won last week at Iowa after beating Wisconsin by two touchdowns two games before that. Don’t make the mistake of assuming the Wildcats will treat this trip to play Minnesota (5-5, 2-5) on Saturday as some kind of meaningless scrimmage, though. 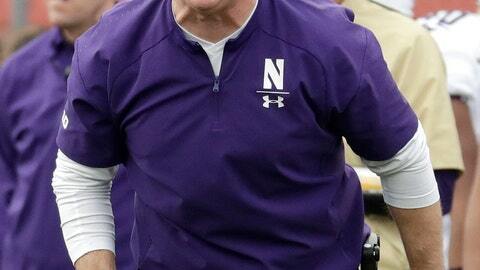 This is coach Pat Fitzgerald’s team, after all. Six of Northwestern’s games have been decided by five points or fewer. Factor that in with the external anticipation of at least a slight drop-off in intensity following the clinch and an unfulfilled goal for the Gophers of becoming bowl-game eligible and, voila, the Wildcats became one-point underdogs by midweek. That has created another avenue for Fitzgerald to steer his players down in attempt to move past the elation of clinching the program’s first division title. The Gophers produced a stunningly lopsided 41-10 victory last week over a Purdue team that beat Ohio State by 29 points as well as Iowa. One more win and they’ll get to go to a bowl game, after missing out in coach P.J. Fleck’s first year. The final home game would be the best way to go, particularly considering a trip to Wisconsin comes next. Freshman running back Isaiah Bowser, thrust into a prominent role after Jeremy Larkin was forced to retire because of a spinal issue, has been a force for Northwestern this fall, with 483 rushing yards and four touchdowns over the last four games. After the Gophers allowed an average of 43 points and 508 yards over their first six Big Ten games, Fleck fired defensive coordinator Robb Smith and made defensive line coach Joe Rossi the interim replacement. The improvement against a high-scoring Purdue team was remarkable. Fitzgerald has already ruled out three injured starters in the secondary, cornerbacks Montre Hartage and Trae Williams and safety Jared McGee, for this game. They’re all expected to return yet this season. Hartage was hurt at Iowa, and Williams and McGee the week before that. Shut out by the Wildcats in two of their last three meetings, the Gophers will present a far more competent passing attack behind freshman Tanner Morgan this time. They lead the Big Ten, ranking 11th in the FBS, with 14.59 yards per completion. Tyler Johnson leads the conference with 948 receiving yards. The Gophers will recognize 11 departing seniors before the game, including injured running back Rodney Smith. They’re counting on Smith returning for a sixth year in 2019, however, once the medical redshirt has been formally approved by the NCAA. Northwestern is averaging just 3.1 penalties per game, the fewest in the FBS. Minnesota (4.2) is second in the Big Ten and seventh nationally.